Now that we’re half way through 2017 it seemed appropriate to have a look at energy usage from the solar panels – especially as those six months reflect the first six months with the battery storage system. The graph is taken from my ImmerSUN smart controller which automatically diverts surplus solar electricity to the car charger or immersion heater. 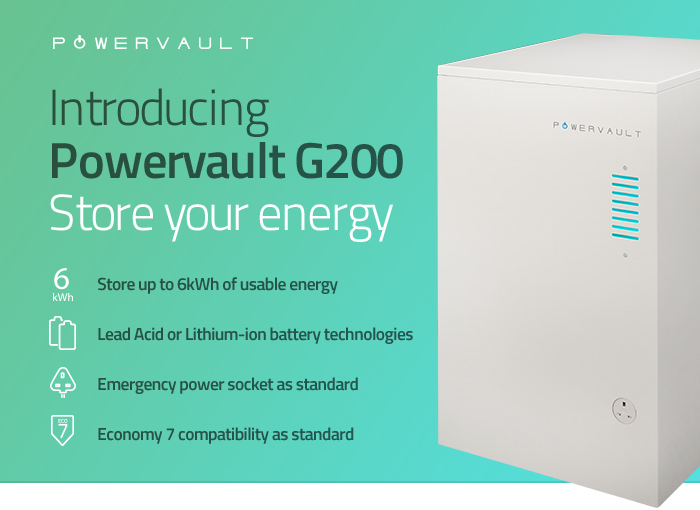 The battery storage system has independent controls but its benefits can be seen via the ImmerSUN. 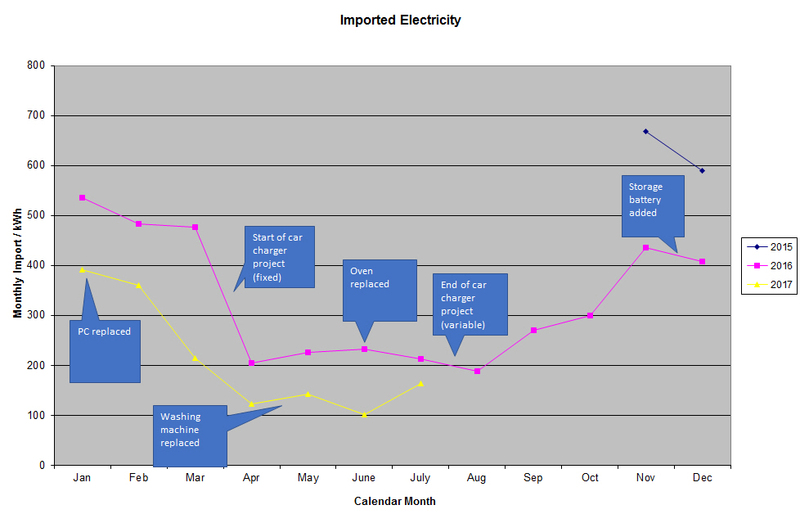 The purple line shows the consumption of electricity (excluding the immersion heater) and is relatively stable month by month. Consumption is relatively large due to my electric car and cooking with electricity. The green line shows the generation of electricity from my solar panels. Not surprisingly output is lower in the winter, but from April we generate more electricity than we use despite our relatively high consumption. In principle we could be electricity independent during those months but for the time of consumption not matching the time of generation. The red line complements the green line as it shows the import or purchase of electricity from the grid, and thus reduces as the generation rises. The blue line shows the diversion of electricity to heat water via the immersion heater when neither the battery storage system nor the car charger can absorb the available electricity. Finally on the graph the turquoise line shows export of electricity to the grid when all smart capability within the house to use electricity is exhausted i.e. battery storage system at maximum power or full, electric car battery full or absent, and water in cylinder is hot. ‘Savings” at £80 refer only to the value of the water heating achieved from solar electricity versus buying electricity (although our backup is mains gas). “Self consumption” at 86% refers to the proportion of solar panel output used i.e. not exported to the grid. “Green contribution” at 59% refers to the proportion of total electricity consumption (excluding water heating) derived from the panels rather than from the grid. This entry was posted in Energy, Solar PV on 08/07/2017 by Greening Me. I’ve now completed 6 calendar months with the battery storage system. Those six months cover January – June so might be considered representative of the year as a whole. I have real-time monitoring of solar panel output and house consumption / export so I have clear visibility that the battery is working and storing energy, and then discharging energy through the evening as I see the house with near zero electricity consumption sometimes through into the early hours of the morning (less if we’ve cooked our evening meal on electricity). So, environmentally it’s doing its stuff, but what is it saving financially? There are at least three ways to assess that, so let’s see how they look. Firstly, from the capacity of the battery (4 kWh), and assuming that it’s filled daily one can calculate a benefit. That benefit would tend to overestimate benefit in winter when there may not be enough energy to fill the battery, but equally could understate saving some days when the battery goes through repeated periods of charging and discharging during the day. One could imagine the heating cycle of the dishwasher, for example, perhaps causing some discharge of the battery during the day if the washing machine load isn’t met from the solar panels, but then then re-charging before the evening and thus its daily throughput being higher than it’s capacity as some of that capacity is used more than once per day. 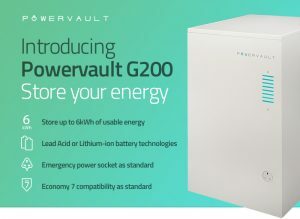 So, if the battery stores 4 kWh and there are 365 days in a year where each kWh not bought is worth 11.5 p/kWh then the saving might be 4 kWh/day x 365 days/year x 11.5 p/kWh = £167.90. Secondly, let’s look at electricity savings. If I compare the first 6 months of 2017 (with a battery) to the first 6 months of 2016 (without a battery) then electricity purchase has reduced by 824 kWh (38%). Thus the saving could be 824 kWh/six-months x 2 six-months/year x 11.5 p/kWh = £189.52. Of course, as my chart shows, there are other changes that potentially impact electricity use between those 2 time periods, so that might be an overestimate. The third and final way that I’ve analysed this is to look at the data about how the output of the solar panels has been used. In 2016 I used 44% of the output of the panels to replace bought electricity, and a further 28% of output to replace gas consumption. In the first half of 2017 however I used 63% of the output of the panel to replace bought electricity, but only 24% of output to replace gas consumption. The reduction in use for water heating reflects the prioritisation of the battery over water heating as a kWh of electricity purchase avoided is much more valuable than a kWh of gas purchase avoided. 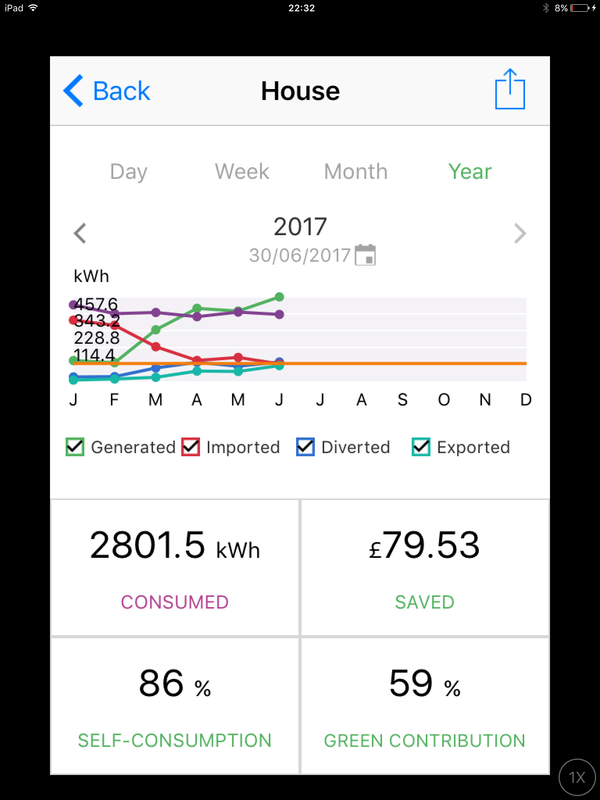 Against 2016’s full year generation of 4,192 kWh that gives a saving of only £87.84 which is much the lowest of the 3 figures. However this only accounts for more efficient use of the solar panel output, and not winter savings from shifting energy purchase from day to night time when it’s cheaper. This entry was posted in Electricity storage on 08/07/2017 by Greening Me.